Thyroid Hormones are amine hormones and so their synthesis is based on the amino acid tyrosine. The primary synthetic organ of Thyroid Hormones is the thyroid gland which produces about twenty times more T4 compared to T3. T4 is then converted to either T3 or rT3 by the enzyme 'Iodinase' which is present throughout the body's tissues. The thyroid gland is full of thyroid follicles which are the basic units of thyroid hormone synthesis (For detailed histology see Thyroid Histology). The thyroid follicles are surrounded by a lining of follicular epithelial cells and contain an acellular lumen full of proteinacious material termed the Thyroid Colloid. Synthesis of thyroid hormones is a complex multi-step process which possesses steps that occur within the follicular epithelial cells and also within the acellular follicular lumen. Large amounts of Iodine are required for synthesis of physiological levels of thyroid hormones. To generate sufficient concentrations of Iodine, the ionic form of the atom, Iodide (I-) is actively transported from the blood stream into the follicular lumen by the Follicular Epithelial Cells. Consequently, Iodide is highly concentrated in the thyroid gland compared to the rest of the body. Thyroglobulin is a protein that contains large numbers of tyrosine amino acids that go on to become individual thyroid hormone molecules. Thyroglobulin is synthesized within the follicular epithelial cell and secreted into the follicular lumen. Peroxidase then combines MIT and DIT residues to generate T4 or T3 species within the thyroglobulin protein, a process termed "Coupling". T4 is generated by combining two DIT residues while T3 is generated by combining one DIT residue with one MIT residue. Importantly, peroxidase is much more efficient at combining of two DIT residues and thus generation of T4 occurs much more readily, explaining why the thyroid gland primarily produces T4 rather than T3. Notably, some MIT and DIT residues do not get coupled and so peroxidase-processed thyroglobulin will retain some MIT and DIT residues. Peroxidase-processed thyroglobulin is then endocytosed by follicular epithelial cells on a regulated basis whenever the thyroid gland is stimulated to release thyroid hormone into the circulation. Importantly, peroxidase-processed thyroglobulin within the follicle can act as a reservoir for thyroid hormones in the absence of stimulation for hormone release. Importantly, this reservoir of peroxidase-processed thyroglobulin is usually enough for months of use explaining why defects in thyroid hormone synthesis often take months to become clinically apparent. 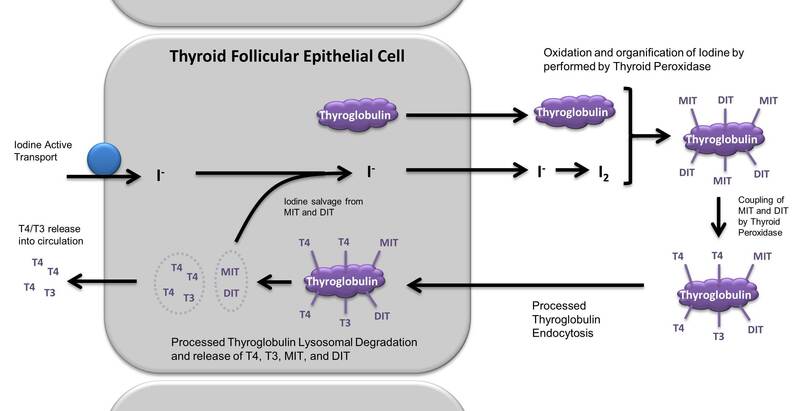 Once endocytosed into the follicular epithelial Cell, the thyroglobulin is broken down by lysosomes, thus releasing attached T4, T3, MIT, and DIT. T4 and T3 are then transported out of the follicular epithelial cells and into the circulation. The iodine atoms of MIT and DIT are salvaged and transported back into the follicular lumen as I-.